Recently I acted as a witness to a court marriage in New Delhi. This wasn’t a normal wedding. Rather, it was an interreligious wedding between a Muslim man and a Hindu woman. The two, who are both academics, decided to get married after a few years of courtship. While Hindu-Muslim weddings in India are not a regular occurrence, they are not uncommon. Interfaith marriages were rarer a generation ago but today it is not unusual for everyone to know someone who has a partner from outside their religious community. As I was signing marriage documents as a witness of the local community, my mind was preoccupied with the concept of “love jihad.” A new coinage, the term has been popularized by right-wing Hindu groups across India, especially in western Uttar Pradesh. There, several politicians, mainly members of the right-wing Bharatiya Janata Party (BJP), have argued that Muslim males have been seducing Hindu women, and have been converting these women to Islam under the pretext of marriage. According to BJP politicians, the practice of “love jihad” has grown alarmingly common in the state of Uttar Pradesh, especially in Muslim-dominated areas. Thus, they argue, the time has come for such interreligious marriages to stop. Large parts of India never heard of this phrase until three months ago. But ever since the BJP came to power in New Delhi, the term “love jihad” has become a part of the popular consciousness all over India. This terminology may be part of a sustained campaign in parts of western Uttar Pradesh to consolidate Hindus against Muslims, which would help the BJP in elections. How real is “love jihad”? According to an investigative report by NDTV, a New Delhi-based TV channel, “love jihad” is a political campaign by the BJP against India’s minority Muslim community, aiming to polarize voters in the name of religion. Uttar Pradesh will soon go to the polls. 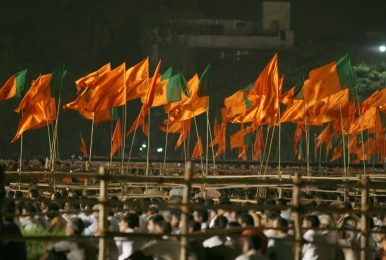 The Rashtriya Swayamsevak Sangh (RSS), a Hindu organization that is often affiliated with the BJP, recently launched a campaign in Uttar Pradesh claiming that recent religious riots in parts of the state have been engineered by Muslims to convert Hindu women to Islam. The RSS has launched a door to door campaign warning Hindu families about interacting with Muslims. As a result, India’s most populous state is sitting on a religious tinderbox. The social fabric of the state is on the verge of tearing apart. Recently, a BJP parliamentarian, Sakshi Maharaj, stated that madrasas (Muslim schools) produce terrorists as they impart an education in terrorism, which added to interreligious tensions. Additionally, a senior cabinet minister, Maneka Gandhi, argued that money from Muslims slaughtering cows (considered holy by Hindus) went into the funding of terror outfits. This concerted anti-Muslim campaign in parts of India raises questions about the intentions of Prime Minister Narendra Modi’s government in New Delhi. On one hand, the Prime Minister wants the riots to stop and wishes to emphasize economic development; on the other hand, he does not show a willingness to stand against rabid politicians from his own party. This raises skepticism as to whether Modi, who himself has been accused of anti-Muslim activity in the past, is really serious about or capable of maintaining religious harmony in India as there is a wide gap between his rhetoric and the reality of what is happening in parts of the country. His silence can be construed as an endorsement of divisive politics. Economic development cannot occur in a vacuum. Growth without social peace is not possible. “Love jihad” is a political slogan that aims to divide society. Nation-building involves bringing all people and communities together. Since 1947, India has been trying to create unity in diversity through secularism. The consequences of majoritarian politics are evident through the examples of Pakistan and Sri Lanka. Thus, secularism has been a stabilizing factor for India. We should defend this way of life and resist those who seek to undermine it. What I witnessed in the magistrate’s court in Delhi was a triumph of Indian secularism and should be celebrated.